Last week I had a crazy idea. I wanted to eat a snack that wasn’t sweet. Yes, I guess I’m getting old and boring. But I had a vision. I had a dream. A dream of a fresh cucumber-based snack. Of course with some garlic in it. After all, what’s a snack without garlic? I tell you what it is: not welcome in my kitchen. So I basically wanted something like a tzatziki but in snack form. And it really is like a tzatziki in snack form. Kinda like a cream cheese dip, but not heavy – light, herby, garlicky, lemony. Delicious. I’m not gonna lie to you – it’s super simple. And it is what it looks like – dip on a cucumber slice. I realize I am not going to win the Nobel Prize for this invention, even though you and I, both realize that’s super unfair and wrong. But I don’t even care. Who needs a Nobel Prize when you have dip on a cucumber? The first day I ate this as a snack and the next few days in lettuce wraps. It’s a great addition to fish, other vegetables, lentils, really anything. I even have to admit I like it more in wraps – as a snack it might be a little too strong for some of you, even though I still love it from the bottom of my heart. This dip actually gets better when it stays after a day in the fridge. But even if you eat it right away – it’s very tasty. The great thing about this little dip is that it’s anti-inflammatory (among other things). Lately I am focused on eating more anti-inflammatory foods because I gained some weight, but also because of some health complaints like joint pain and allergy. Well this dip is made out of sunflower seeds and walnuts, so I have a good omega-3/omega-6 ratio. And it’s also filled with garlic and mint – which are both powerful anti-inflammatory foods. Put capers, walnuts, sunflower seeds, lemon juice, vinegar and 4 tbsp water and blend together. If not smooth enough add more water. For me it took around 6-7 tbsp water. Add black pepper, garlic, mint, cumin (optional) and blend again. 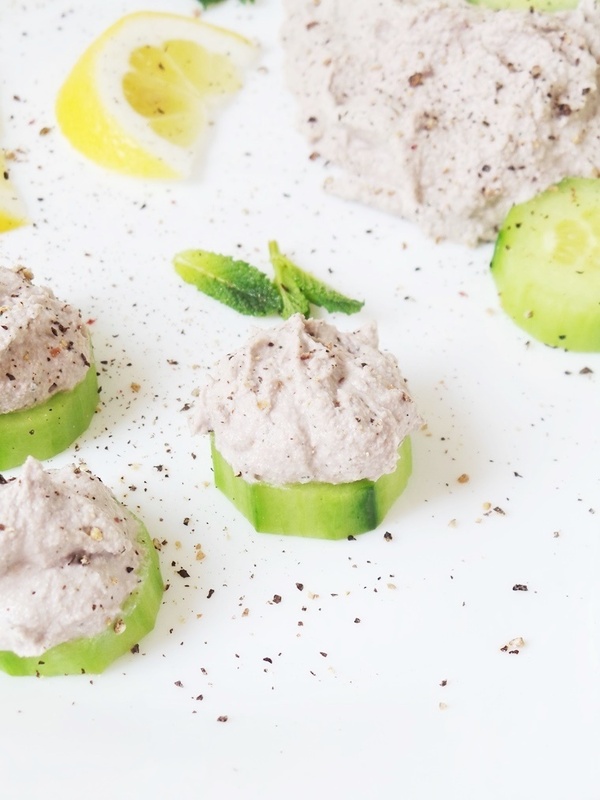 Slice the cucumber into slices (not too thick, not too thin) and top with a tsp of the dip.